Offers knowledge and insight to those who want to understand the movements and events behind the modern-day hostilities wracking Western and Islamic societies. This title clarifies how the Muslim world, sees the history of the world, and what they therefore make of our own version of events. Start reading Destiny Disrupted on your Kindle in under a minute. "A must-read for anyone who wants to learn more about the history of the Islamic world. But the book is more than just a litany of past events. It is also an indispensable guide to understanding the political debates and conflicts of today, from 9/11 to the wars in Iraq and Afghanistan, from the Somali pirates to the Palestinian/Israeli conflict. As Ansary writes in his conclusion, "The conflict wracking the modern world is not, I think, best understood as a 'clash of civilizations.' ... It's better understood as the friction generated by two mismatched world histories intersecting." "A lively, thorough and accessible survey of the history of Islam (both the religion and its political dimension) that explores many of the disconnects between Islam and the West." "Ansary has written an informative and thoroughly engaging look at the past, present and future of Islam. With his seamless and charming prose, he challenges conventional wisdom and appeals for a fuller understanding of how Islam and the world at large have shaped each other. And that makes this book, in this uneasy, contentious post 9/11 world, a must-read." I initially liked this book lots and told almost everyone I knew about it. I would go over and reread much of it because I truly was very interested with finally someone recognising the other side to the story!!!. I (being a practicing Muslim) liked that it wasn't a western secular book on Islamic history, but it wasn't a religious Islamic book on Islamic history - but was somewhere very neutral. Almost too neutral and a tad vague - especially towards the end. Which did end up being my only criticism. I enjoyed the social aspect and considerations to why certain political situations arose. It wasn't about one bad leader vs another. It was more about ideas of people being incompatible. This also was frustrating at times as it was almost too passive and never pointed the finger squarely at anyone - so nothing was really anyone's fault - from this authors prospective. Where as I can draw my own conclusions of where blame lies, this book leaves that mostly blank. The author's work was well written, and their style was really nice to read. Like a conversation one would have if the history of Islam was being discussed over dinner. It made it more human not just dates and names. Relate-able. But at the same time some dates were kind of vague. But the book was extremely informative, it's just one would have to double check and research the info in another source to get the true guts of it. But I don't think that's the point of this book. It's not a reference book of facts, it's the story of the clashing of western and Islamic narratives and idea. It does that job brilliantly. For any non Muslim, I highly recommend the book. It's a starting point to understand important things of why things are the way they are. I do think not many non Muslims would have the patience to read it though. For highly practicing Muslims, the book will frustrate in terms of it's vagueness and wishy-washy fundamental tawheed dusting over (which I hated!). It needed to be more potent and precise but I don't think that is the author's thing. It totally skims over the usa's blame for anything. And it alludes to bin laden being responsible for 9/11 - which is debatable and contentious. I do recommend the book but from about 80% it just goes too fast and dusts over the details and dates, and then abruptly ends with an "afterward" which doesn't conclude much. So the end to destiny disrupted was mostly a destiny disrupted... Could have ended with more gusto rather than shoulder shrugging and "I don't know's". There are lots of sad points in the book from a Muslim prospective, but lots of eye opening points from either prospective. And ultimately this is just my point of view on a particular authors point of view on history. 5.0 out of 5 starsI wish all history was explained so well. A fitting together of glimpsed pieces of a puzzle. World events seen from both Western and Eastern cultures make much more sense. Compex situations made understandable by “everyday” language. After three decades as a U.S. military leader--rising to the highest levels leading in the counternarrative fight--and half of that spent STUDYING Islam, I kinda thought I had a decent grasp of the Muslim world's historical narrative. Having taught War College, I knew Islam's history of expansion as the faith grew. I knew many of the great names--some, like the Rashidun Caliphs, through spiritual study; some, like Saladin and Tamerlane, through their military prowess. I even knew that several of the great philosopher-scientists of "our" history, like Averroes & Avicenna were, in fact, the great Islamic theologians & jurists Ibn Rushd & Ibn Sina. So when I bought this book a few years back, I was mainly looking for a tool to help me TEACH OTHERS that world history isn't just the set of objective facts we learn in Western schools, but instead more like a play rewritten again & again to cast each of its characters in turn as the lead. I got that--but I also learned a lot MYSELF--and I just completed my SECOND read through. Perhaps most important, this book overviews the CONNECTIVE TISSUE tying all those HISTORICAL EVENTS that I knew into HISTORY--through which I learned a lot about HOW the Muslim world got from what it was at one point in its journey, to what it was at another, and WHY Islamic culture and Western culture progressed in very different directions after each point at which their paths intersected. In some cases, I also learned that I'd completely misunderstood the relationship between key pieces of the narrative--for example, that three of the great Islamic empires (the Ottomans, the Safavids, and the Moghuls) existed somewhat CONCURRENTLY, rather than one after the other, and interacted (or didn't) in ways that significantly shaped our world. And I got a sharp and detailed reminder that imperfect men and their baser motives have wreaked as much havoc on a world guided by Islam (and how the Message of that faith was carried down through history) as they have on OUR world guided by Christianity, and how CHRIST'S message got handed down. In short, whether you're only a casual student of OUR OWN history, or one who's delved pretty extensively into the Muslim world, this is a really useful book for helping a Western reader escape the blinders of what, more than likely, we simply learned as a timeline of objective facts and events, to understand how seeing the same events through a Muslim lens can endow particular themes & crosscurrents with very different cognitive meaning and emotional weight. 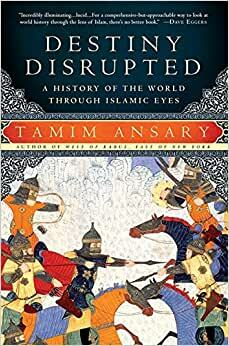 And this, in turn, is of enormous value in trying to understand the ways that 'Islamic' history and our 'Western' history have wandered into one another--Ansary uses the metaphor of two crowds of people, each going somewhere, crossing paths...to "much bumping and crashing" (p. 353)--including how each culture, while condemning the actions and beliefs of groups like Da'esh (ISIS) and al-Qa'ida just as strongly--can yet view our "War on Terrorism" quite differently...as well as how we might BETTER proceed, from those distinct viewpoints, to overcome the evil that is enemy to us both. That said, the book also has significant flaws that will be evident to advanced readers--of which those new to this material should also be aware. Ansary is NOT a scholar of Islam, and shortcomings in his own knowledge (and/or his personal biases) often lead him to conclusions that obscure equally- or even MORE valid lessons. For example, in discussing al-Ghazali's "The Incoherence of the Philosophers," he misses a core point about the relationship between reason & revelation, arguing that Ghazali's conclusion that God is the ONLY true cause of anything robbed science in the Muslim world of its purpose--when Ghazali was more properly arguing that the value of science (observing that cause in action) lay in helping us holistically understand our world and its relationship to our Creator: This, in turn, weakens his comparison of the Protestant Reformation to the Islamic history of the same time: while a STRENGTH of his book is generally its stance outside the Western (or 'Orientalist') cultural perspective, Ansary is clearly enamored of the Protestant Reformation, and credits it with unchaining the Western mind to inquire, using its emerging tools of science, in directions and at a speed that a mind simultaneously seeking to understand the same physical world AND HOW IT RELATES TO GOD AND FAITH would not. Yet, in an era when we're creating all sorts of feats of science (like armed drones & cloned embryos), making national decisions based solely on our own perceived interests, and plowing ahead into a changing climate with little regard for how it might CHANGE US BACK, we might do well to ask ourselves what OUR culture might have to learn from the ISLAMIC perspective as well. My recommendation: give it a read, with these things in mind. Then, if your interests focus inward, on detailed understanding of how these different 'histories' impact Islamic and Western views of specific events, look at works like Maalouf's The Crusades Through Arab Eyes (Saqi Essentials) or Cobb's The Race for Paradise: An Islamic History of the Crusades. Or, if your interests focus OUTWARD, toward better understanding of alternative, non-Western ways of looking at our world--past, present & future--in general, consider works like Wael Hallaq's Restating Orientalism: A Critique of Modern Knowledge. 5.0 out of 5 starsLiberal or conservative, religious or non religious--this is a book all should read. Destiny Disrupted is a must book for all of us who value our American Culture and what to understand why we as a people and country are embroiled in conflicts in the middle east.. Why, because this is one of the few books that helps the reader understand the political, social, cultural, militaristic forces at work since 9-11-01. However, these forces did not just pop up because of an act of terrorism but as the author points out there are two worlds, European/Christian and Arab/ Islam have been a two forces for 1400 years. These forces are not easy to understand and have elements that create conflict as well as similarities. Ansary's writing style makes difficult topics and concepts understandable in every day common language. As a retired high school history teacher, I wish this book were printed while I was still teaching world history and us history. this should be mandatory reading in your college history classes. Imagine sitting in a coffee lounge, sharing an hour or two with a knowledgeable and accessible Islamic scholar as he retells the past 1400 years of world history from a refreshingly different perspective than the one Westerners are accustomed to. Not that Afghan-born Tamim Ansary is an apologist or propagandist for his Faith, but rather an objective observer of past crises, current events, and future trends. One thing you may be sure of, by the time you reach p347 of this guided tour behind-the-scenes of tomorrow's headline news, you will have a clearer understanding of the motives, the means, and the men who are shaping it amidst the wreckage of broken lives and shattered populations across the Middle East. For further research there is also a useful appendix with annotated comments and bibliography. By the time you get to any influence by the west, I could find not one problem in the Muslim world that could not be traced to anything BUT the West. Even purely positive events like Eisenhower backing the Egyptian bid to re-take the Suez Canal is cast in a terrible light (i.e. the only reason the US helped out was because of the Cold War so it doesn't count). There are countless other examples but I'll stop here. I'm glad I read it because I wanted to see how Islam saw the world...and it is a depressingly selfish view. Same as the stereotypical West. A wonderful perspective look that allows me to generally understand how Muslims think and why. ( Of course, not all as you cannot generalize everyone from any specific group and put them in the same box.) However, how people see themselves looking at history from their perspective clears up all the BS from the news and allows you to see people as people. Especially how religion is and is not the sole motivating factor in the middle east in regards to jihad. And what that word meant originally and probably does so today. If anyone believes in the west their worldview has not been shaped and continues to be through the media and schooling you are fooling yourself. History is written by the victor. Doesn't make it the truth or totally accurate. This book gave me a foundation to see a different perspective of the middle east politically and religiously from a historical point of view just as you cannot extricate the catholic church from European politics and history during the same time period. I love history and this is a nice beginner book to understanding the events by being able to see both sides.